Almost half-a-million visitors are expected in South Africa during the month-long FIFA World Cup between June and July this year. This is the biggest tournament ever hosted by South Africa to date and government is leaving nothing to chance to ensure that it will be safe and secure. 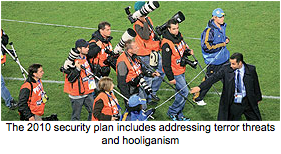 By late November last year, the South African Police Service announced its comprehensive security plan to ensure the safety of visitors during the 2010 FIFA World Cup. The security plan, which includes addressing terror threats and hooliganism, has been approved by the world's football governing body, FIFA. Government has set aside about R640 million to employ 41,000 police officers specifically for the event. The figure includes 31 000 permanent members and 10 000 reservists. "The vast majority of the police deployed for the World Cup will be trained officers with experience in major events," said Police Minister, Nathi Mthethwa. 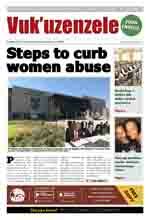 The security plan was praised by the 2010 FIFA World Cup Inter-Ministerial Committee. The Committee chairperson, Deputy President Kgalema Motlanthe, said he was satisfied with the overall state of readiness to host a safe and secure FIFA World Cup. The report on Security Arrangements states that plans are being put into operation in all provinces and host cities. These include training of officers responsible for command and control centres, general policing and crowd control, as well as specialised units responsible for airspace control, organised crime, counterterrorism and human trafficking. Checking of service providers and training of private security officers employed by the Local Organising Committee is also underway. In addition to these safety measures, countries competing in the tournament will also send their own specially trained police officers. They will help with language and cultural differences and will support the South African police. Each of the 32 qualifying teams is also expected to send at least two trained officers to support the security forces during the tournament. From the day South Africa won the bid to host the event, preparations started. During the Confederations Cup in June last year, all required security measures were put into place to ensure a safe tournament. The Confederations Cup was a forerunner to the World Cup and helped to highlight areas of the security plans that needed further work ahead of the World Cup.